DLP stands for Digital Light Processing, a video display technology developed by Texas Instruments. DLP tech can be used in a variety of video display platforms but is mostly used in video projectors. In the past, it was used in some rear-projection TVs, which are no longer available. A lamp passes light through a spinning color wheel, which then bounces off of a single chip (referred to as a DMD chip) that has a surface covered with microscopic-sized tilting mirrors. The reflected light patterns then pass through the lens, and onto the screen. At the core of every DLP video projector is the DMD (Digital Micromirror Device). This is a type of chip that is structured so that every pixel is a reflective mirror. That means anywhere from one to two (or more) million micromirrors are on each DMD, depending on the intended display resolution and how the mirror tilt speed is controlled. As the video image source is displayed on the DMD chip. The micromirrors (each micromirror represents one pixel) then tilt very rapidly as the image changes. This process produces the grayscale foundation for the image. Color is then added as light passes through a high-speed spinning color wheel and is reflected off of the micromirrors on the DLP chip as they rapidly tilt towards or away from the color wheel and light source. The degree of tilt of each micromirror coupled with the rapidly spinning color wheel determines the color structure of the projected image. As the amplified light bounces off the micromirrors, it is sent through the lens and can be projected onto a large screen suitable for viewing. Another way that DLP is implemented (in high-end home theater or commercial cinema use) is to utilize a separate DLP chip for each primary color. This type of design eliminates the need for the spinning color wheel. Instead of the color wheel, light from a single source is passed through a prism, which creates separate red, green, and blue light sources. The split light sources are then reflected on each of the chips designated for each primary color, and from there, projected onto a screen. This application is very expensive, in comparison to the color wheel method, which is why it is rarely available for consumers. Although 3-Chip DLP technology is very expensive to implement, two other, less expensive alternatives have been used successfully (and more affordable) to eliminate the need for a spinning color wheel. One method is to use an LED light source. You can have a separate LED for each primary color, or a white LED split into primary colors using a prism or color filters. These options not only eliminate the need for a color wheel, but produces less heat, and draws less power than a traditional lamp. Increased use of this option has given rise to a category of products referred to as Pico Projectors. 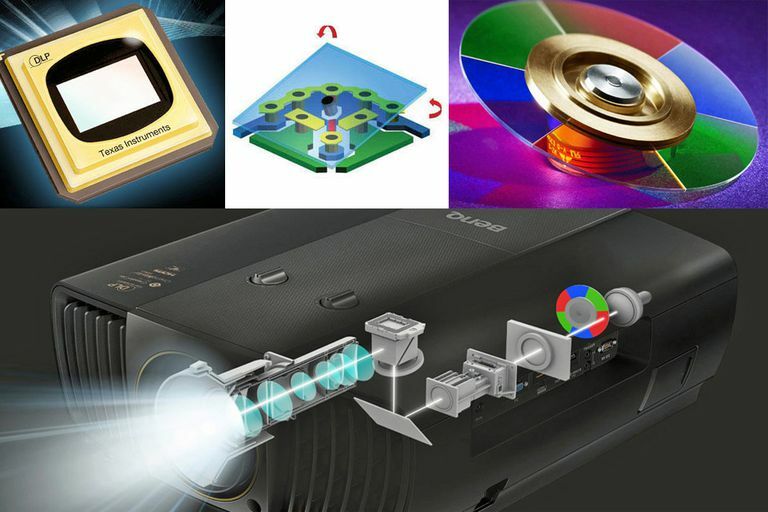 Another option is to employ Laser or Laser/LED Hybrid light sources, which, like, the LED-only solution, not only eliminates the color wheel, produces less heat, and draws less power, but also serves to improve color reproduction and brightness. However, the laser approach is more expensive than straight LED or the Lamp/Color Wheel options (but is still less expensive than the 3-chip option). Although the "one-chip with color wheel" version of DLP technology is very affordable and can produce very good results in terms of color and contrast, there are two drawbacks. One drawback is the amount of color light output (color brightness) is not at the same level as the white light output. The second drawback is the presence of "The Rainbow Effect". The rainbow effect is an artifact that reveals itself as a brief flash of colors between the screen and eyes when the viewer rapidly looks from side to side on the screen or looks rapidly from the screen to either side of the room. These flash of colors look like small flickering rainbows. This effect does not occur frequently, and many people do not exhibit sensitivity to it at all. However, if you are sensitive to this effect, it can be distracting. Your susceptibility to the rainbow effect should be taken into consideration when purchasing a DLP video projector. DLP video projectors that use an LED or Laser light source are much less likely to exhibit the rainbow effect, as a spinning color wheel is not present. For a more in-depth technical look at how DLP technology and DMDs work, check out the video from Applied Science. Also, check out our periodically updated listings of Mini, Cheap, High-End, and Gaming projectors which include either DLP or LCD technology.